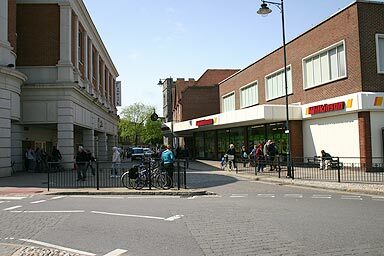 You are standing on the south-east side of Canterbury, looking North-west along the main street which runs through the City. Ahead of you is St. Georges Street, a pedestrianised area of shops and trees. This end of town was nearly completely destroyed in one air raid in the Second World War. It was rebuilt after the war and again starting in 2000. If you turn right here, you will find yourself in Burgate which leads to the Cathedral. Turning left is a pleasant walk along the remaining part of the City Walls. In reality, use the subway, otherwise you will be killed. Behind you is the road to Dover.